U.S. Dollar and Euro notes are seen in this June 22, 2017 illustration photo. TOKYO - The euro was on the defensive early on Monday after Austria’s election and on concerns over Catalonia’s confrontation with Madrid, though the dollar also lacked momentum after soft U.S. inflation data. 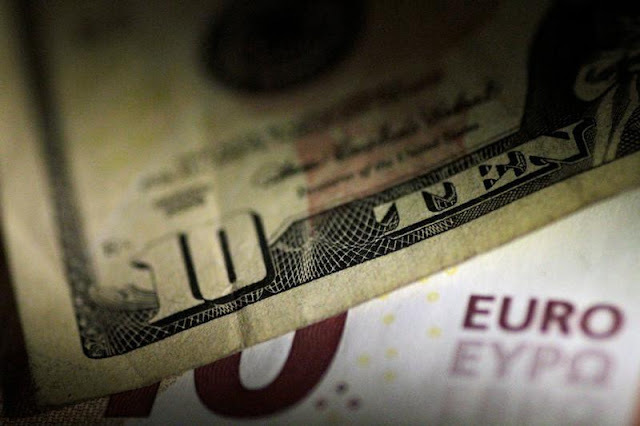 The euro fell as much as 0.25 percent in early trade and last stood at $1.1806, down 0.2 percent, slipping further from a 2 1/2-week high of $1.1880 touched on Thursday. Austria’s young conservative star Sebastian Kurz is on track to become the country’s next leader after an election on Sunday. He will likely seek a coalition with the resurgent far right as his party is far short of a majority. Investors also kept an eye on Spain, where Catalan leader Carles Puigdemont has until 10:00 a.m. local (0800 GMT) on Monday to clarify whether he is calling for the region’s independence. Prime Minister Mariano Rajoy has given him the Monday deadline to clarify his position -- and until Thursday to change his mind if he insists on a split -- and said Madrid would suspend Catalonia’s autonomy if he chooses independence. Still, the fall in the common currency was limited as investors expect the European Central Bank to unveil a plan later this month to start tapering its bond buying scheme. “Politics could affect the euro in the long run. But new Austrian leader while being tough on immigration doesn’t seem to be against the euro. In the near term, the ECB’s policy is likely to be the main focus,” said Minori Uchida, chief currency strategist at Bank of Tokyo-Mitsubishi UFJ. Investors were not excited about the dollar, either, after Friday’s U.S. consumer price data underscored persistently low inflation. Although U.S. consumer prices rose the most in eight months in September as gasoline prices soared in the wake of hurricane-related refinery disruptions, underlying inflation remained muted. Against the yen, the dollar changed hands at 111.96 yen, little changed on the day, though it has bounced back from Friday’s low of 111.69, which was its lowest since late September. The dollar index was little changed at 93.16, lacking momentum after having posted its first weekly fall last week after having recovered since mid-September, driven by expectations of a Fed rate hike in December and hopes of tax cuts by U.S. President Donald Trump. “It seems as though the short-covering phase in the dollar might be over,” said Tohru Sasaki, head of market research at JPMorgan Chase Bank. The dollar/yen’s correlation has fallen with the Fed’s rate hike expectations for this year since late September, suggesting the market is more focusing on the Fed’s longer term policy outlook. The euro was on the defensive early on Monday after Austria’s election and on concerns over Catalonia’s confrontation with Madrid, though the dollar also lacked momentum after soft U.S. inflation data.